Will MSP hike in Budget FY19 be inflationary? The Finance Minister also decided to increase food subsidy by 21% or Rs 29,041 crore to Rs 1.69 lakh crore. The government decision to raise minimum support price (MSP) for crops in Budget FY19 has become a debatable topic among analysts for its impact on India’s inflation ahead. In the Budget FY19, Finance Minister Arun Jaitley announced to raise minimum support price (MSP) for all crops. MSP will now be set at 1.5 times of agriculture production cost and for this the FM proposed to ensure cost plus 50% for all the monsoon crops. Currently, there are 23 crops supported by MSP. Jaitley also decided to increase food subsidy by 21% or Rs 29,041 crore to Rs 1.69 lakh crore. 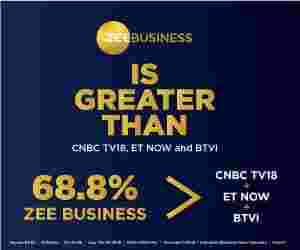 Now with this rise, many are expecting that this would fuel higher food inflation, which will impact over Consumer Price Index ( CPI), making the RBI's task difficult in its monetary policy meeting. According to HDFC Bank Investment Advisory Group, given the increase in the fiscal deficit numbers as well as the hike in MSPs, RBI’s futures monetary policy stance going forward will be very important from the perspective of fixed income markets. Let’s understand how MSP hike will unlikely impact the inflation. Currently, the Commission for Agricultural Costs and Prices (CACP) gives three definitions of production costs: A2, A2+FL and C2. Generally, the A2 costs cover all paid-out expenses, both in cash and in kind, incurred by farmers on seeds, fertilisers, chemicals, hired labour, fuel, irrigation, etc. While A2+FL takes into account actual paid-out costs plus an imputed value of unpaid family labour. Lastly, the C2 factor are more comprehensive, accounting for rentals and interest forgone on owned land and fixed capital assets respectively on top of A2+FL. As per SBI, the budget has clearly specified two things. Firstly to provide a better price to all Rabi and Kharif crops by fixing MSP at 1.5 times over the cost of production. Secondly, supplementing such a scheme to develop an institutional mechanism to compensate the price difference where market price is less than MSP. 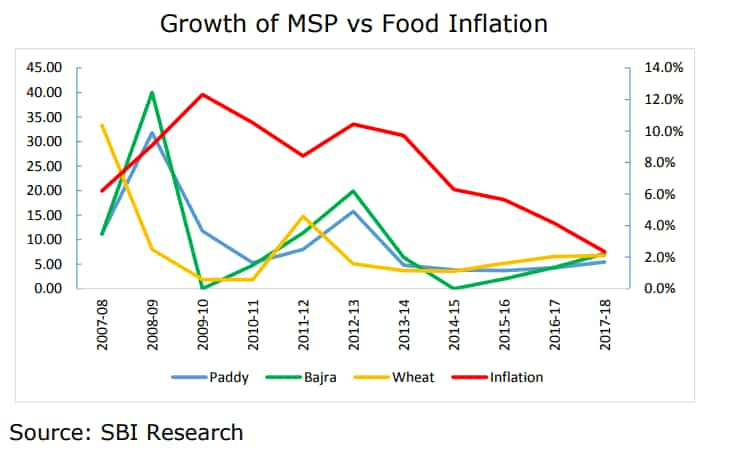 From the data above, it can be seen that long run trend growth of MSP of Paddy, Bajra and Wheat with food inflation suggests that the degree of relationship between them is weak. 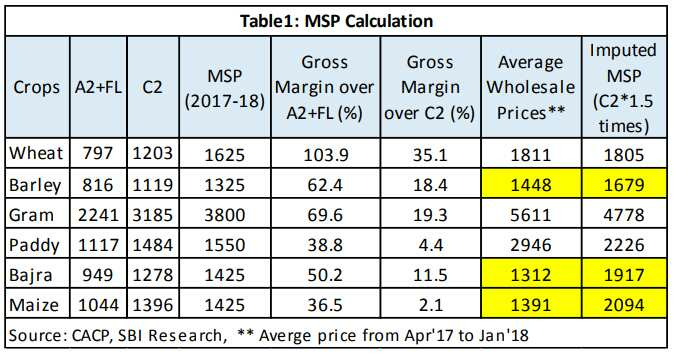 Also, the imputed MSP based on C2 is even higher than market prices of Barley, Bajra and Maize. Further, Ghosh said this suggest that in such situations the farmers may be compensated by the difference between prevailing MSP and market prices, if the prevailing MSP is lower than market prices. “We expect that the Budget has clearly specified such a scheme. This scheme could be a modified version of ‘Bhavantar Yojana’ at national level, in line with the states like Madhya Pradesh and Haryana who have already implemented,” Ghosh added. Earlier, RBI conducted a study on examining long-run impact of hikes in MSP of food crops, under which it was known that rice and wheat on food inflation shows that it were not as “over-bearing” as were generally perceived. Moreover, so far in FY18, four states have waived farm loans with a total amount of Rs 88,000 crore which has had a significant impact on state exchequer. SBI has estimated the cost under “Bhavantar scheme” for selected crops where wholesale price was lower than MSP across various states. The findings suggest that the cost to state exchequer is only 11% of the total farm loan waiver amount declared by UP, Maharashtra, Punjab and Karnataka. Furthermore, benefit of this scheme is the price difference will be directly paid into farmers accounts like other DBT scheme. SBI says, "So it will stop the leakages and the accounts of the farmers will remain active, with continued flow of transactions." Whether MSP hike impacts inflation or not will be keenly watched as RBI is set to announce FY18's last monetary policy on February 7. In December monetary policy, RBI expected inflation in the range of 4.3% to 4.7% in Q3 and Q4 of this year, including the HRA effect of up to 35 basis points with risks evenly balanced. CPI inflation has already reached 17-month high of 5.21% in December 2017, primarily driven by vegetables, house rent and fuel. A detailed guidelines on MSP will be put in place by Niti Aayog in consultation with Central and state governments soon.